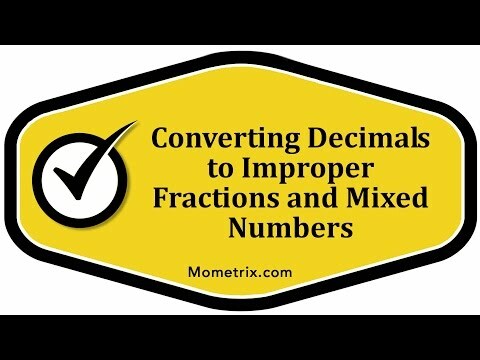 The first step in converting a decimal to an improper fraction is to convert the decimal to a mixed number. We’ll convert to mixed numbers first. In this first example, we have 7.6. To Convert this to a mixed number. We’ll take the whole part or the part to the left of the decimal, which is 7, and then we’ll take the part to the right of the decimal, which is a 6. Now, we can put the 6 over a power of 10 and there’s only one digit to the right of the decimal, so there’s only one zero. We have 7 and 6 over 10. Now, we can reduce this fraction by dividing top and bottom by 2. We have 3 on top and 5 on the bottom. This is equivalent to 7 and 3/5. Now, to convert this to an improper fraction, we’ll multiply the denominator by the whole number and then add the numerator. 5 times 7 is 35 plus 3 is 38. We have 38 over 5. In this next example, we’re going to once again take the whole number part, just the 5, and then we will put the part to the right of the decimal over a power of ten. Two places to the right of the decimal, so two zeroes, 35 over 100. We can reduce this by dividing top and bottom by five. 35 over 5 is 7. 100 over 5 is 20. This is equivalent to 5 and 7 over 20. To convert to an improper fraction now, we’ll multiply 20 times 5 which is 100 plus 7, which is 107. We have 107 over 20. In the final example, we’ll once again take the whole number of part, three. Then take the part to the right of the decimal. 375 over three decimal places, so three zeroes. 375 over 1000. Now, we can divide top and bottom here by 125 which leaves us with 3 over 8. This number is equivalent to 3 and 3/8. Now, to convert to an improper fraction we’ll once again multiply 8 times 3 which is 24, plus 3 which is 27. We have 27 over 8.